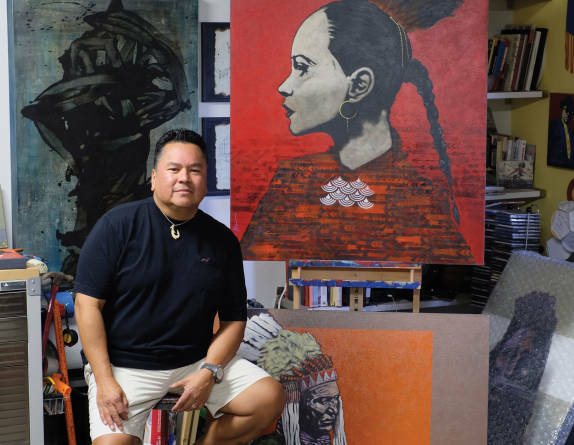 Above: Nocona Burgess in his Santa Fe studio. Photograph by John McCauley. The 97th Santa Fe Indian Market brings more than 150,000 artists and collectors to town (swaia.org), among them Comanche painter and Santa Fean Nocona Burgess, whose contemporary works can be found in the permanent collection of the Smithsonian Institution’s National Museum of the American Indian, in Washington, D.C., and in museums and galleries around the world. What do you think makes Indian Market special? This market is the best of the best. It’s the biggest and longest-standing, and it’s juried, so you’re getting a really good-quality show. If you invest in a piece of jewelry or a pot here, you’re getting the best there is in the Indian art world. You have stuff that’s super-contemporary and super-traditional. I’m mostly known for my Native portraits and animals, but I always bring a little experimental stuff to the market. Are there other artists whose work you’re particularly interested to see this year? Monty Little is an up-and-coming young Diné painter—real cutting-edge. He does portraiture—layered, very abstract, bold lines. And Sheldon Harvey, he paints these mystical beings that are kind of angelic. He does abstract landscapes, real intense animals, sculptures made out of old wood. I’ve got a bunch of his paintings and sculptures at my house. I’m a big fan. I do a lot of trading and collecting at the market. What are your other favorite events at the market? The film competition, the Institute of American Indian Arts show at the Museum of Contemporary Native Arts, the fashion show, music on the Plaza—those are all really good. The Friday-night preview, of course. And the gallery openings. A lot of the artists who are showing at the market will also have an opening at a gallery Thursday or Friday night. I show a lot of larger works at my gallery [True West, 130 Lincoln Ave., truewestgallery.com] and the smaller stuff at the market, because you only have so much space in your booth. The restaurants around the Plaza get really packed, but there are lots of food vendors with roasted corn, Navajo tacos, chile, mutton, and fry bread. They have really traditional meals. It’s all good.